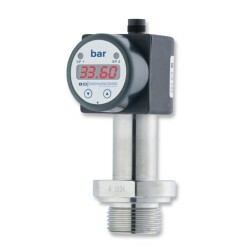 Measure vacuum, positive gauge and absolute pressures from -1 bar (-15psi) up to 40 bar (600psi) with this all in one electronic switch, gauge and sensor. 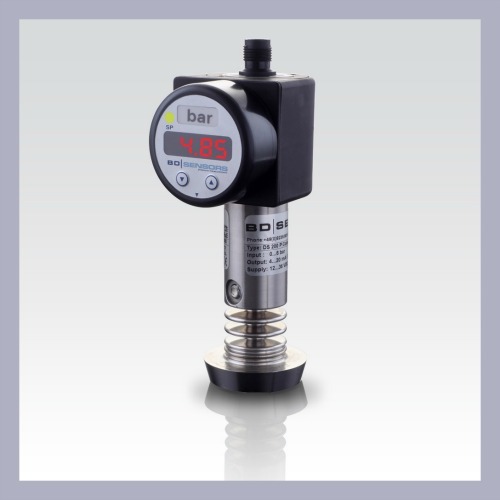 Designed specifically for use in the food, drink and biomedical industry for measuring process pressures and vessel contents. Choose dairy pipe or clamp type sanitary process fittings and select a food grade oil fill as the diaphragm isolation fluid. For pharmaceutical installations requiring hazardous dust protection the instrument includes the option for ATEX intrinsic safety. Switch Contacts: 1,2 or 4 PNP type, 125mA max with 4-20mA (2 or 3 wire) or 500mA max with 0-10V output. The DS200P multifunction sanitary pressure gauge combines an electronic switch, analogue output sensor and digital readout all within one instrument. This combination of functions can be used to provide a signal to the process control system, a local alarm signal which can activate a warning light or sound, when pressure limits are exceeded and a visual display of the process pressure for thee operators of the process equipment. This pressure instrument has been specially engineered to incorporate all the essential product features required by the pharmaceutical, food and drink processing industry. All materials exposed to the process media are welded stainless steel 316L with clean crevice free surfaces. To prevent contamination of the process due to a diaphragm failure, a non-toxic oil is used as the isolation fluid between the outer stainless steel diaphragm and the inner sensing element. Various sizes of sanitary clamp and dairy pipe process connection can be provided depending on the sizes of pipe to which the sensor is being fitted. For high temperature processes it is possible to select the cooling element option which allows the sensors to be used with media up to 250degC for food grade applications and 300 degC for processes excluded from sanitary requirements. The DS200P sanitary pressure sensor can also be used as hydrostatic level gauge with ranges as low as 0-1 mH2O (3 ftWG). The gauge mounted in any orientation and the display easily rotated and twisted for easy reading of the liquid height in the tank. What type of industries use the DS 200P? The DS200 P is intended to be used by the medical, food and beverage industry, but because of the cooling element option, it it is often used by other industries when measuring high temperature media. What is the ATEX rating of this device for gas and temperature? The ATEX IS version has 1 x PNP output, is this output intrinsically safe and is there a wiring diagram associated with this type of device? Yes the PNP-Open collector switching outputs are included as part of the ATEX approval. The circuit diagram showing the recommended wiring including a zener barrier is shown the graphic below. Is the reason for the food grade oil for in case of a leak? Yes if you are using on food/drink/medicine processing equipment with hygienic requirements, it is a safer to use a food grade oil fill behind the thin isolation diaphragm so that if it fails it does leak a toxic substance into the process. I plan to directly connect the DS200P to a chamber which will contain steam (100% water vapor) at a minimum of 100°C. I notice that the maximum temperature for the electronics on the data sheet is 85°C, so if I’m mounting the gauge directly to a chamber with a surface temperature of a t least 100°C, I don’t think it will be suitable, unless you can explain how we can get round this temperature limitation? Assuming the ambient temperature is lower surrounding the chamber, it is possible to use this to protect the electronics from temperatures higher than 85°C. The DS200P can have an optional cooling element between the process connection and the electronics to protect it from temperatures up to 200°C (300°C with FFKM seals), so the surface temperature of the chamber is not a problem as long as the surrounding air temperature is below +85°C which is the maximum operating temperature limit for the internal electronics. Mounting the gauge underneath or on the side (the display can be rotated) of the chamber will also help reduce the air temperature immediately surrounding the gauge by avoiding the hot air rising above the chamber. Will the display show 3 decimal places? It will depend on the pressure range and the units you specify to display the pressure. The are 4 digits available altogether over a range of -1999 … +9999. Please select the options you require for the DS200P Sanitary Low Range Pressure Gauge, Switch and Sensor in your application and request a quote. Send us your enquiry for DS200P Sanitary Low Range Pressure Gauge, Switch and Sensor to get assistance with this product type.